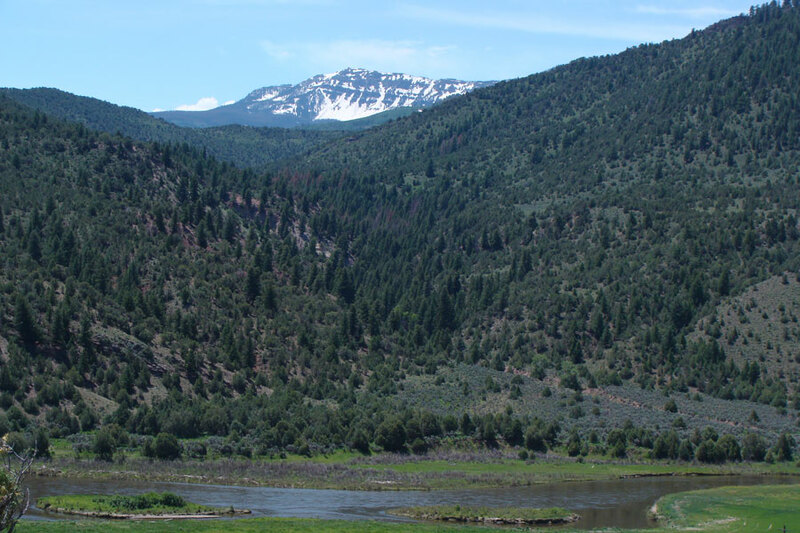 Leroux Land and Cattle LLC is located along the Colorado River near the small town of Radium Colorado. Radium is south of Kremmling and midway between Vail and Steamboat Springs.. 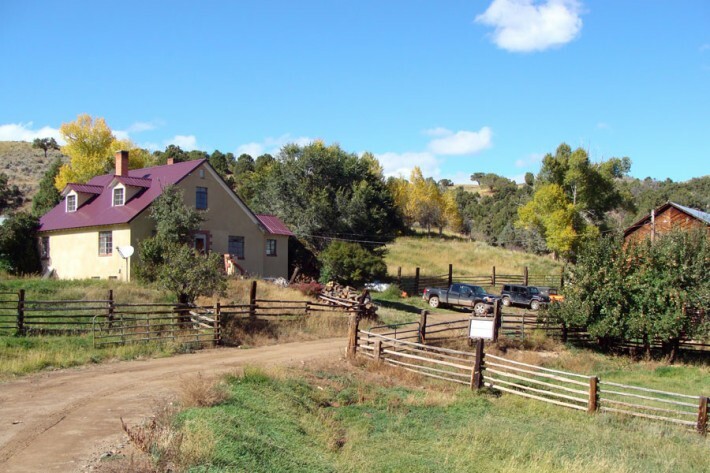 In 2011 The Leroux Ranch was awarded Colorado’s Centennial Ranch Status for being owned by the same family for over 100 years. Leroux Land and Cattle LLC is owned by Mike and Ann Leroux and their two children Laura and Daniel. Mike was raised on the ranch. In 1974 he took over the operation of the ranch. Following the death of his father, he returned to Colorado State University in 1987 to continue his education. In 1989 Mike and Ann were married and Mike graduated with a Bachelors Degree in Economics with a Minor in Political Science. Mike began work for Farm Credit Services as a Agricultural Loan Officer. He moved to Monfort Finance Company, a financial subsidiary of Con Agra, where he worked 8 years as their Loan Officer and Loan Administrator. In 2000 he returned to Farm Credit Services where he served as their Loan Audit Team Project Coordinator. Along with running the ranch he has spent the past 11 winters doing tax accounting and providing tax advice to a number of individual and business clients. Ann has had an out standing career in advertising and print sales. She just completed her 15th year with Vision Graphics Inc. in Loveland Colorado. Her primary niche is production of maps for both national and international companies. She also prints brochures, catalogs, banners and other advertising materials. Daniel and Laura are completing their primary education at Windsor High School. 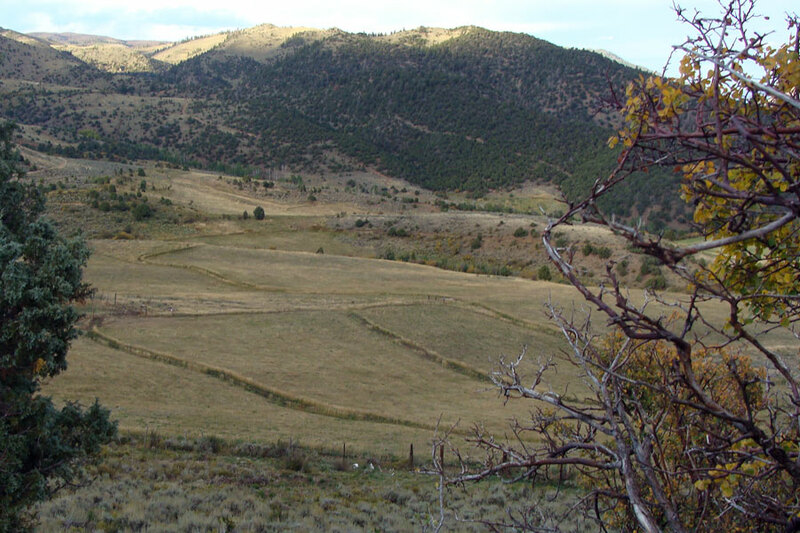 Mike and Ann have maintained the operation by working with the ranch neighbors and leasing ground on Colorado’s eastern slope near where they preform their other jobs. 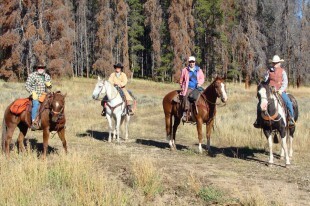 Mike has able to focus on ranching since 2008. Ultimately we raise our calves to become beef. It is our goal to provide a product that is sought out by our customers, the meat consuming public. We need to provide a product that is healthy, attractive, tender and tastes good. We measure this quality by tracking traits such as marbling, fat content and rib-eye size which are genetically transferable. Leroux Land and Cattle LLC actively selects for dams and sires with EPDS reflecting these positive traits. Sale bulls that do not meet our selection criteria are sold directly to customers as beef sides, allowing us to ascertain we are raising a quality product. 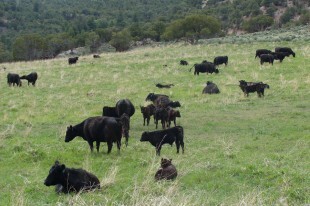 The economics of raising cattle vary due to climate, elevation and available feed. 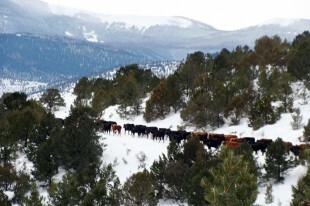 Wintering cattle in the Colorado Mountains requires efficient use of harvested forage, usually hay, to winter the cattle as long as 6 months while the ground is covered by snow. A cow in this environment needs to be able to maintain her body heat, grow a baby calf inside her and maintain a reasonable body condition to preform optimally once the calf is born. Once the grass starts growing she has quality feed in the form of grass until the calf is weaned that fall. A larger cow generally needs more feed to maintain herself and raise a calf. If she raises a proportionately larger calf over a smaller cow she can be equally efficient. We have found, in our environment, many large cows have problems maintaining adequate body condition so they can breed back each year or the cow will concentrate on maintaining her body condition and calf performance suffers. We feel that as long as the cow has a healthy calf each year and weans over 50% of her body weight on average, she is earning her keep. Leroux Land and Cattle LLC’s goal is to develop productive moderately framed cattle whose calves approach a 60% calf to cow ratio at the time the calves are weaned. It is our belief each cow should raise a live calf each year. If the calf dies or has major health issues prior to serving their intended purpose as breeding stock or becoming beef they are causing you to lose money. Many calf losses are related to genetic traits such as overly large calves, Brisket Disease (High Altitude Sickness) or calves that just do not thrive due to the dam just not giving adequate milk. Breeding and inbreeding for traits such as maximum growth and milk in more mild environments can lead to genetically inferior animals. Often excessive milk will provide excellent growth but the dam has problems breeding back or has a limited production life due to the cow not being able to maintain good body condition. The Colorado Mountains long winters and predatory wildlife tend to naturally select for positive traits such as easy keepers and mothering ability. Recognizing this, Leroux Land and Cattle strives to maintain sires and dams with moderate to light birth weights, a moderate frame, good growth, adequate milking ability and good mothering ability with a mild disposition. We are always looking for an above average animal with a balanced pedigree. We have tested all potential carriers that exist in our herd for AM, CA,NH and DD. With the exception of one cow purchased in 2010 who was a NH carrier, no carriers have been identified. That cow and her progeny have been culled. Leroux Land and Cattle will continue to test any potential carriers of genetic inferiorities and cull any positive carriers. 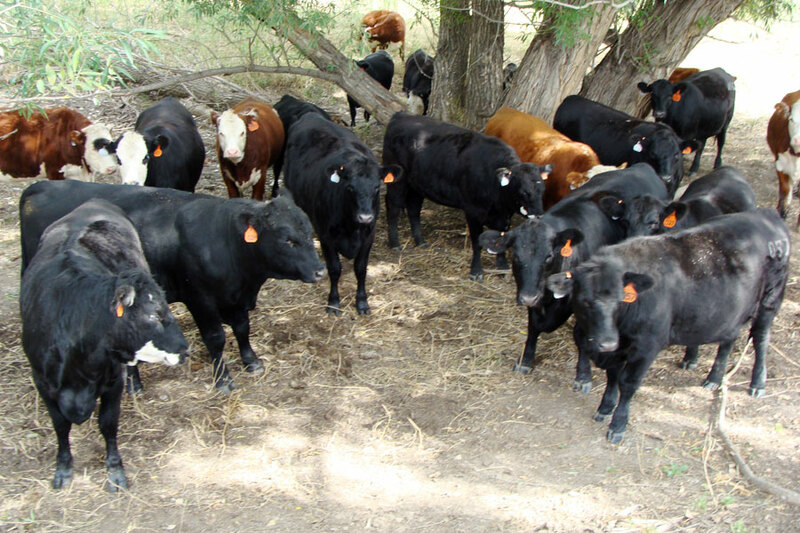 We would be happy to have you look at our reasonably priced bulls and replacement heifers whenever you need cattle for your operation. Please feel free to contact us at any time to look at our available sale cattle. In the mid-1800s, Owen F. Leroux and his 4 brothers brought a herd of cattle from Leavenworth Kansas, grazing them up the Arkansas River to Leadville and over the passes into what is now known as the Vail and Eagle Valleys of central Colorado. Each fall they would trail the cattle back over the passes and back down stream to winter in the Fort Garland area. Their father was a prospector and miner and he and his boys supplemented their income working in the mines around Breckenridge and Leadville. In the late 1870’s, an early winter storm prevented them from returning back over the passes. Hoping the snow would melt off and they could make it over the passes to the front-range shortly, they purchased hay from local ranchers to bide the cattle over. Unfortunately conditions did not improve and one of the worst snow years known to the area occurred causing catastrophic livestock losses to the Colorado Mountain homesteaders and devastating the Leroux herd. Following this setback most of the Leroux family turned to mining for their livelihood. Owen married Ida Mae Winslow the daughter of one of the original homesteaders in the Sheephorn Valley directly north from where the Leroux cattle were lost. He homesteaded directly across the Colorado River from the Winslow homestead in 1905. Ida and Owen had 5 sons Leon, Dewey, William Roy (Roy), Arthur and John and one daughter Lois. 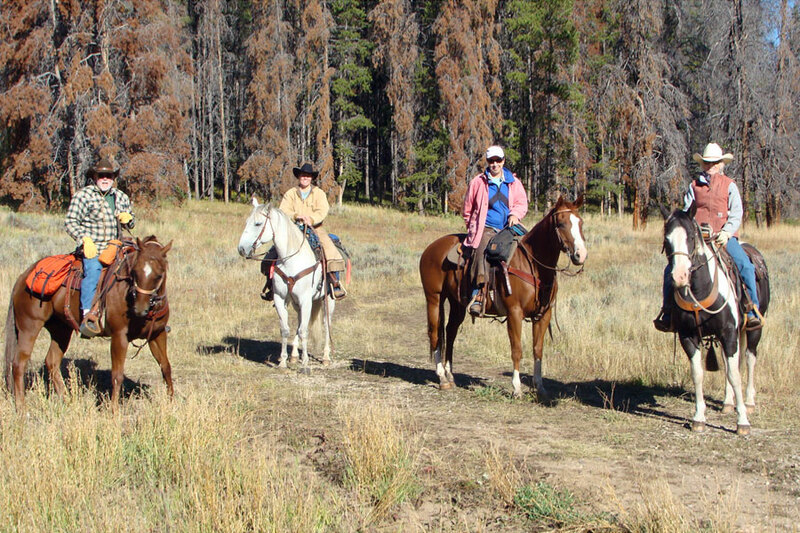 Following John Winslow’s death, Ida and her children ran the ranch as Leroux Cattle Company, purchased neighboring ranches and were the original permittees on BLM and Forest Permits. Arthur and John left home and started their own businesses. Roy Leroux homesteaded a grazing section and he and his wife Lucille purchased Arthur and John’s interest in the ranch in 1957. Roy and Lucille and their 5 children owned and operated Roy’s homestead plus one half of the original ranch including the Owen F. Leroux homestead. Leon, Dewey, Lois and her husband Howard Reed owned and operated the other one-half including the Winslow homestead. Leon and Dewey never married and Lois and Howard never had children. 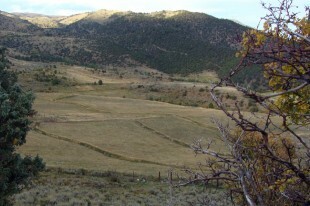 This portion of the ranch was sold in 1976. In 1965, the Roy Leroux family began registering Hereford cattle as Leroux Herefords. In the 1950’s Roy and his children ran registered Hereford cattle purchased from Fay Deberard in the mid 1950’s with the Leroux children all being members of the Junior American Hereford Association. The two youngest children, Linda and Mike, continued raising, showing and selling Hereford cattle. Linda was Colorado Hereford Queen in 1967-8. Roy, Lucille and Mike continued buying small herds such as the Annie Eshe herd at Silt CO and SLW Herd in Greeley, CO. Bulls and additional cows were purchased from the Ferry Carpenter herd as well as other well-known producers such Oches Brothers of Gunnison CO. and Weise Herefords Iowa. In 1976 Michael began purchasing the ranch and completed the purchase in 2008. Michael has been using AI since 1976. In 2010, Mike, Ann, Daniel and Laura formed an operating company Leroux Land and Cattle LLC but still register cattle as Leroux Herefords. In 2008 they sold their commercial cattle and purchased registered Hereford females from the Adams Hirsche of Calgary Alberta, and Jamison Herefords of Gunter Kansas dispersals as well as purchasing females and a herd Sire from Largent Herefords of KayCee Wy. Mike Leroux joined the Angus Association in 1983. He purchased the Mike Shaw herd from Brighton CO. By culling and using AI, he developed Angus cattle that can thrive in the harsh winter environment of the Colorado Mountains. Recently quality females have been purchased from the Basin Angus, G Bar H and Summit Crest Dispersals. 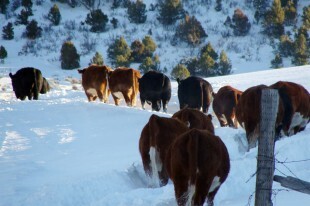 In 2011 they purchased herd sires from Kenny Haas from Lagrange, WY. Leroux Land and Cattle LLC seeks to provide quality mountain proven Hereford and Angus bulls and replacement heifers to ranchers so to help them remain profitable. © 2018 Denton Designs, LLC. All Rights Reserved.